How Big Is God is an exciting multimedia presentation featuring audio and visual effects, computer animation, and a laser stars display. It will take you on a fascinating journey exploring the size of the Earth, Solar System, Milky Way Galaxy, and ultimately the entire universe! You may never be the same. This presentation has been widely received at Homeschooling Conventions, Christian Camps, and churches by people of all ages. NOTE - video clips used to enhance this presentation were removed before uploading to YouTube. To watch the original version from the Seattle Creation Conference, download the video from the link below. Download compressed ZIP file 1GB includes PowerPoint and accessory videos. 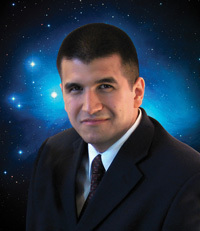 Diego Rodriquez is a creation speaker, homeschooling father, and minister. His real passion in the ministry is teaching and supporting the infallibility of the Word of God. This has led him into the creation ministry and to the founding of the 4th Day Alliance creation astronomy ministry. The 4th Day Alliance is an international creation astronomy ministry with over 2600 members in all 50 states and 29 countries. The purpose of the ministry is to "use astronomy for the glory of God." This presentation was recorded during the Seattle Creation Conference, October 2009 at Mukilteo Foursqure Church. The NW Creation Network organizes numerous educational programs each year, which feature presentations by speakers, scientists, and authors who are dedicated to defending the Bible and the Christian worldview. These events are open to all Bible believers and free to attend. Watch additional recordings from the Seattle Creation Conference online.